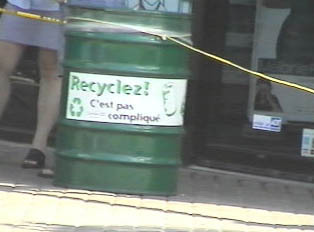 Canadians routinely recycle most materials, such as paper, glass, plastic, and cans. There are separate containers for these materials virtually everywhere. In Montreal, every household receives plastic recycling boxes from the city council to be left in front of the house once a week for the waste management truck. Trash needs to be tied in special trash bags sold for this purpose; storing it in other bags is illegal and subject to fines.